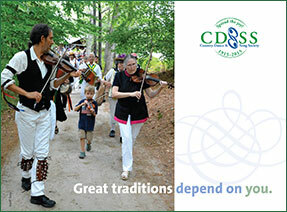 For 100 years, CDSS has supported the North American dance, music, and song community through its camps, grants, scholarships, leadership training, publications, and group services such as liability insurance and tax exemption. We have grown from a very small, volunteer-run operation to a national arts and education organization serving all of North America. With this change in scale and scope has come the need for modern data management tools, a robust online presence, a growing staff of skilled professionals, and sustainable financial practices. To ensure our effectiveness for the future, we now need to invest in CDSS itself, so that we remain the strong, vital center of participatory arts programming you have come to respect and rely upon. Through your support of the Spread the Joy! campaign, you have ensured that CDSS excels and thrives for generations to come.